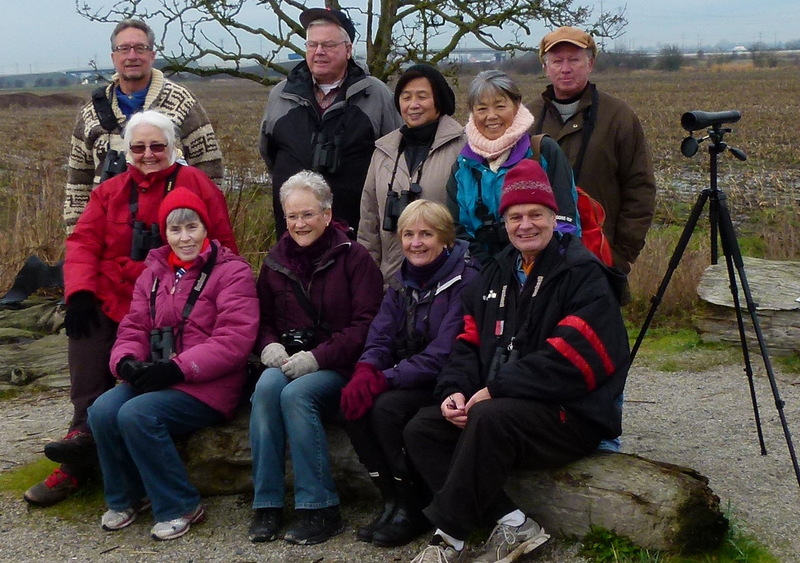 As usual with a local outing, the group of ten birding enthusiasts met at Petra’s to decide on the day’s destination. If not for Sheila’s decision-making we would probably still be sitting there… “72nd it is” she says, and off we went. The group of ten included Ken and Anne A, Jane, Kay, Terry, Mike, Sheila, Marion, the long lost Anne M, and myself (Roger). Our intention was to bird 72nd and then move farther east along the bay, but we had such good luck at the first location that we spent the whole time there. 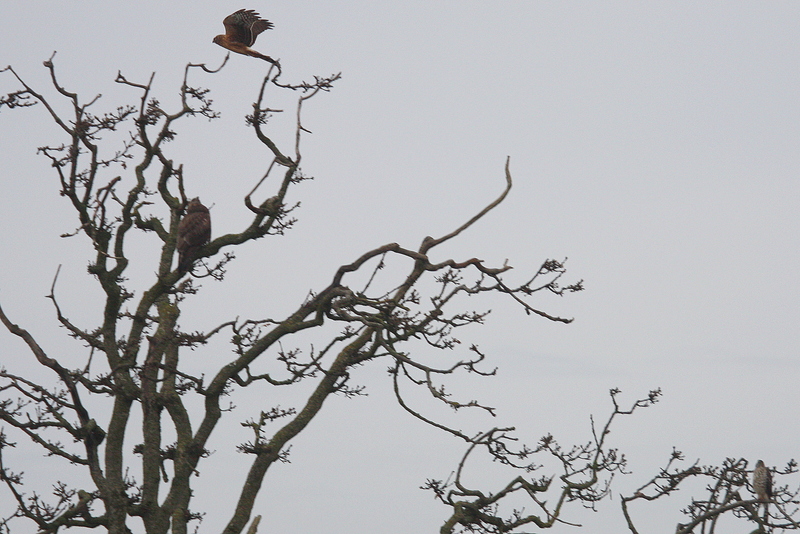 En route (via 36B St) were several Red-tailed Hawks. 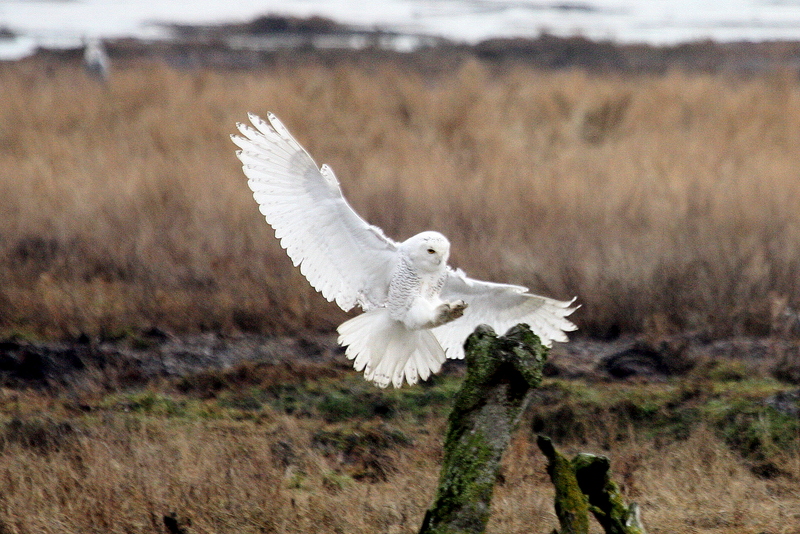 We saw no Snowy Owls east of 72nd, but could see some in the distance towards 64th so started in that direction. 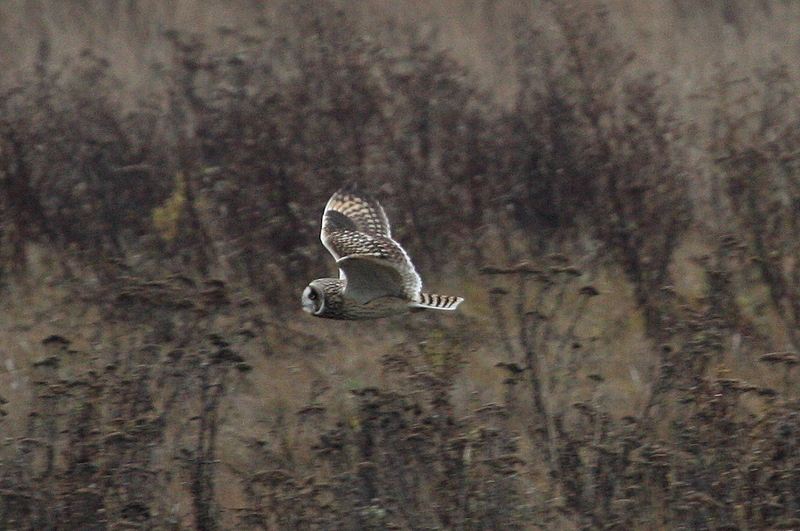 There were no signs of the recently seen Long-eared Owls, but Lorna, our eagle (oops, owl)-eyed sighter wasn’t with us, so we didn’t have much of a chance at finding them. What we did see on the way were quite a few Yellow-rumped Warblers, which seemed strange for this late in the season. Also, several Golden and White-crowned Sparrows, Dark-eyed Juncos, Song and Fox Sparrows, Spotted Towhees, and large numbers of American Robins. Some of the group saw a Marsh Wren, and heard another farther along the dyke. On two occasions we saw a Northern Shrike, one juvenile, and the other an adult which was seen hunting a Yellow-rumped Warbler. 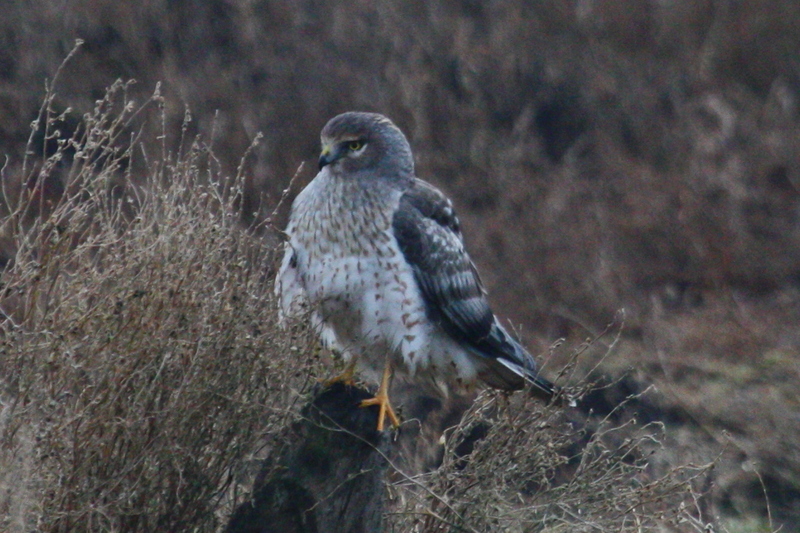 Raptors included several Northern Harriers of both sexes, at least 4 Short-eared Owls close up and with captured prey, 20 plus Snowy Owls, some in flight, some on the roof of a storage tank on the nursery grounds, a few Rough-legged Hawks, a few Cooper’s Hawks, a number of American Bald Eagles, and a Peregrine Falcon. 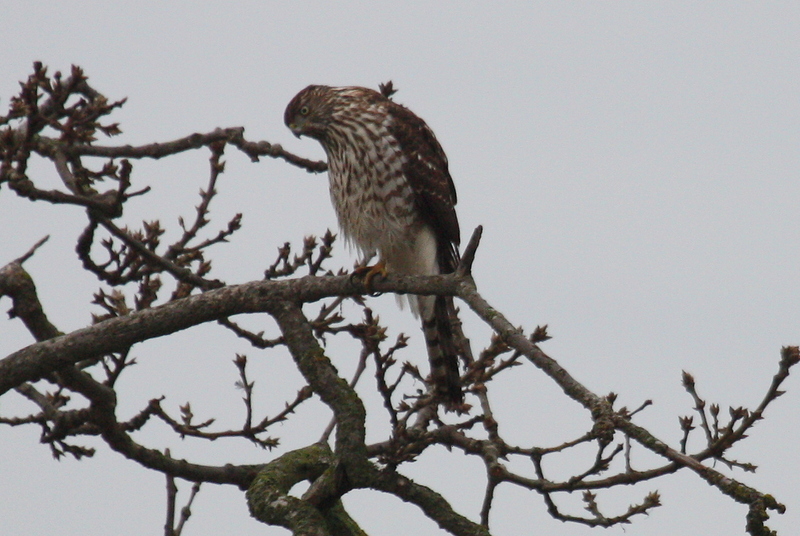 At one point in the tree behind the group photo there was a Rough-legged Hawk, Cooper’s Hawk and Northern Harrier! 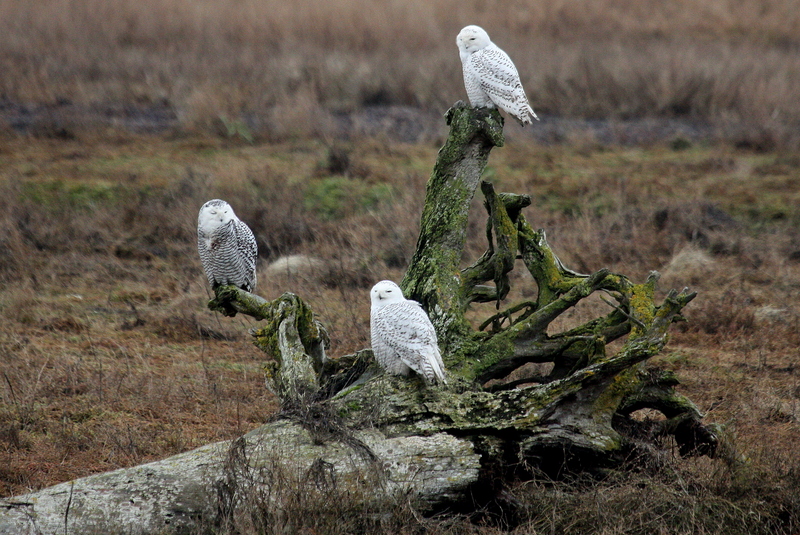 The Snowy Owls seemed to be more concentrated nearer the 64th end of the dyke, in contrast to last year’s birds, and most were farther out from the dyke. We saw both Purple and House finches, and Anne says she will persist in helping us distinguish the difference between them. In the greenhouse property ponds we found the usual collection of Green-winged Teal, American, with two Eurasian, Wigeon, and some Mallards. Also, a Ring-necked Pheasant was sighted in the electrical grounding field. Offshore were the seasonal clouds of Dunlin (probably some Sanderlings included) and rafts of ducks too far off to identify. With noon upon us, the temperature quite cold, and the rain approaching we decided to abandon our other plans of 96th and 104th and call it a day. Also Mike, weak without the usual egg-salad and peanut butter sandwiches, was near starvation and needed emergency sustenance. 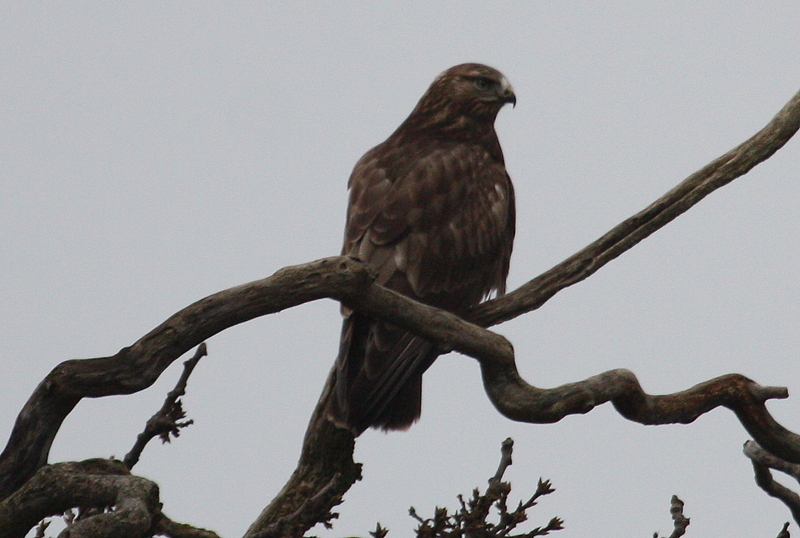 Again, 72nd was rewarding, especially with the variety of raptors… 4 hours well spent. 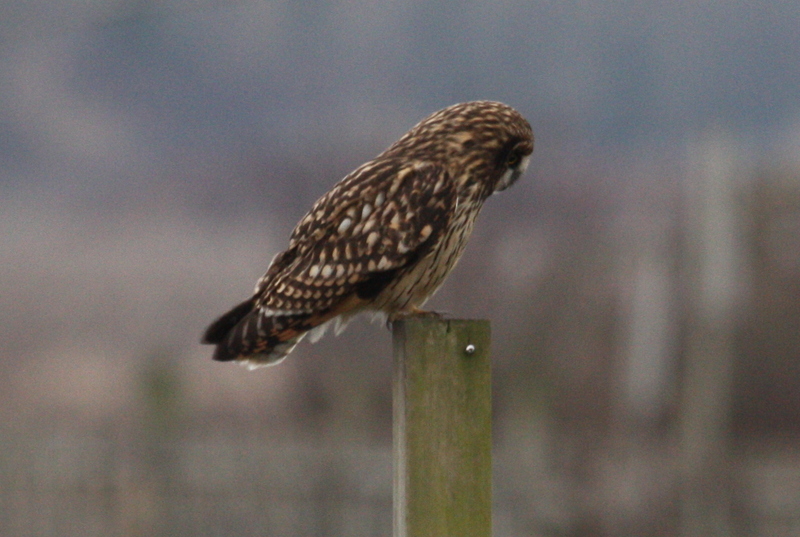 This entry was posted in *DNCB, 64 Street, 72 Street, Bald Eagle, Boundary Bay, Cooper's Hawk, Northern Harrier, Peregrine Falcon, Red-tailed Hawk, Rough-legged Hawk, Short-eared Owl. Bookmark the permalink.